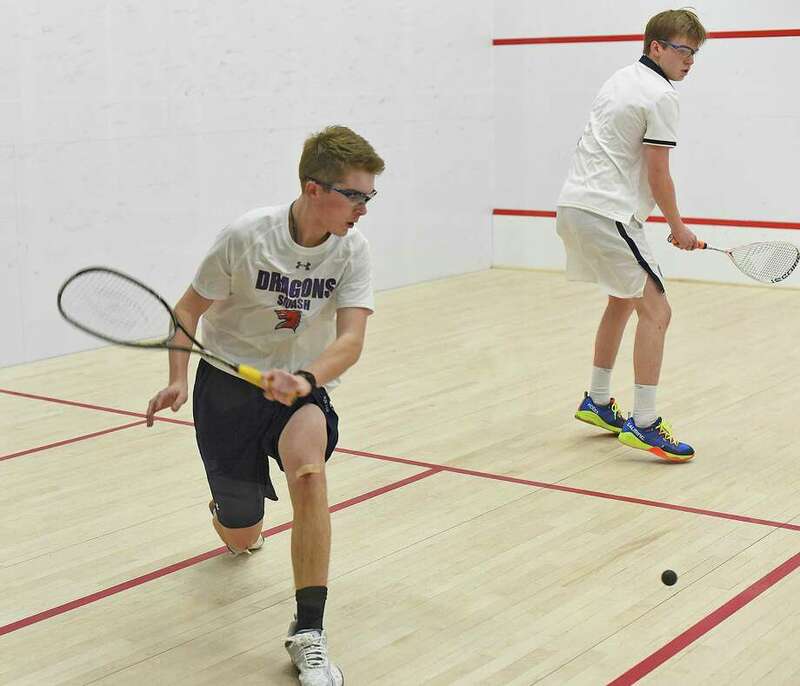 Will Mackle, a resident of New Canaan, left, helped lead the Greens Farms Academy boys squash team to a third-place finish at the US National High School championships over the weekend in Philadelphia. The Greens Farms Academy boys squash team placed third at the U.S. National High School Squash Division V tournament in Philadelphia over the weekend. The Dragons posted a 3-1 record over the weekend. GFA capped its third-place finish by notching a 4-3 win over New Canaan. Jack Soper (Southport) and Giani Panariello (Westport) earned 3-0 wins in their respective matches at No. 2 and No. 7, respectively, by John Selkowitz (Norwalk) and Will Mackle (New Canaan) took 3-1 victories at slots three and five. The Dragons were close to making the championship match, but fell to Tower Hill of Delaware in the semifinals, 4-3. Selkowitz, Mackle, and Panariello each earned victories for the Dragons. Selkowitz won 12-14, 9-11, 11-7, 11-6, 11-8; Mackle won 11-8, 11-13, 7-11, 14-12, 11-9; and Panariello took a 9-11, 8-11, 11-5, 11-7, 11-5 win. Duda Voldman (Stamford) took a game out of the No. 1 slot while Soper was pushed to five games, but fell 11-9 in the fifth game. Earlier in the day, GFA defeated St. Paul’s of Maryland by a 4-3 score in the quarterfinals. Voldman (11-6, 11-7, 11-6) and Marshall Bessey (Darien), who won 15-13, 12-10, 11-8, helped the Dragons earn two points while Mackle (6-11, 11-7, 11-6, 11-7) and Blake Newcomer (Greenwich) won out of the sixth and seventh slots, respectively. In the opening round of the national tournament on Friday, the Dragons raced out to five wins to clinch the match before posting a 5-2 win over Shipley JV. Voldman, Selkowitz, Mackle and Newcomer all posted 3-0 victories to highlight the day for the Dragons. From the top spot, Voldman won 11-3, 11-3, 11-7; Selkowitz earned a 11-5, 11-2, 11-1 win over at No. 3; Mackle won 12-10, 11-6, 11-3 at No. 6; and Newcomer took an 11-6, 11-5, 11-7 win in the seventh slot. Soper, playing out the No. 2 spot, gave GFA a 5-0 lead when he went four games to earn a 5-11, 11-7, 11-5, 11-6 win. Friends Central pulled out a 7-0 win in the opening round, but that doesn’t tell the whole story. Once again playing without two of their top players, which forced other players to step up and play out of position, the Dragons battle extremely tough. Annabelle Kreitler (Fairfield) was edged in a heartbreaker at No. 6, falling by an 8-11, 11-9, 11-7, 12-14, 15-13 score. Lucy Nelson (Westport), playing at No. 4, took a game off her opponent in an 11-8, 4-11, 11-6, 11-7 defeat. Even at No. 1, Clare Foley (Southport) fought hard, losing 11-9, 11-9, 11-5, and at No. 2, Charlotte Cohen (Westport) overcame a slow start while being edged by an 11-1, 11-7, 11-7 score. Even in the seventh slot, GFA’s Caitlin Pasierb (Darien) went down fighting, 11-8, 11-8, 12-10. Julia Edwards (Westport) and Samara Cohen (Westport) also took part in Friday’s opening round. In the consolation round, the Dragons were beaten by Latin School of Chicago, 5-2. Nelson (9-11, 11-9, 9-1, 11-9, 11-5) and Kreitler (11-1, 11-7, 11-3) were the victors for GFA. GFA was awarded a forfeit victory over Brookline High School of Massachusetts in the third round. Greg Lawrence (Fairfield) had 20-20 vision on Wednesday, scoring 20 points and grabbing as many rebounds to lead GFA to a 65-48 win over the Brunswick School. Cole Prowitt-Smith (Fairfield) added 18 points and Henry Holzinger (Westport) chipped in with 13 to pace the GFA effort. The Greens Farms Academy girls basketball team put together one of its best overall efforts of the season in a 58-32 win over Christian Heritage on Monday, starting the week off right. The Dragons raced out to a 34-17 halftime lead and never looked back to improve to 7-9 on the season. Katherine Marcus (New Canaan) scored 23 points to lead the effort while Georgie Grabowski (Stratford) tallied 10 points. Kelly van Hoesen (Greenwich) added seven more. Elyse Kimball (Easton) had five points while Molly Mitchell (Southport) and Alex Wagner (Southport) had four points each. Marcus added seven rebounds, four steals and two assists while van Hoesen had seven boards and four steals. Kristiana Modzelewski (Westport) added seven rebounds while Lilah McCormick (Westport) and Wagner had four rebounds apiece. The Dragons lost a close road contest on Wednesday to Holy Child, 51-42. Marcus led all scorers with 22 points. Grabowski added eight while van Hoesen chipped in with six more. Grabowski had seven rebounds and six steals for GFA while van Hoesen had six rebounds. Marcus had eight steals, four rebounds and three assists. Katherine Marcus continued her strong play for the Dragons, pouring in 32 points. Georgie Grabowski added six while Elyse Kimball, Lilah McCormick and Kelly van Hoesen added two each. Grabowski also grabbed 10 rebounds while Marcus had five rebounds, three assists and three steals. Van Hoesen also had nine rebounds.